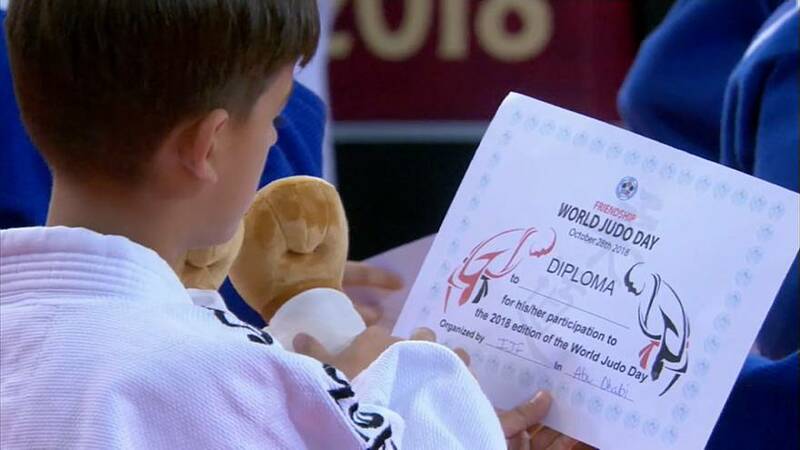 The judo family in Abu Dhabi in the United Arab Emirates celebrated World Judo Day - and this year's theme was Friendship. Judo sent a message of peace to the world, with three-time world champion and Athens 2004 Olympic champion Ilias Iliadis delivering a masterclass for members of the UAE Federation. The Greek great, who won Olympic gold at the age of 17, led a special World Judo Day masterclass during the break on day two as local children and senior members of the U.A.E national team alike were put through their paces by the 31-year-old legend who officially retired last year. Iliadis led a warm up as the world watched live on the IJF Facebook page and the children’s smiles were beamed around the world in a fun and friendly atmosphere that beautifully illustrated this year’s theme of Friendship. The Beijing 2008 Olympic flagbearer squared off against each participant of the masterclass in randori as the younger members politely requested a second contest against their world-renowned coach for the day who duly obliged. Iliadis credits judo with shaping his life and making him the man he is today: A champion, a father, a husband, and an inspiration to the world. 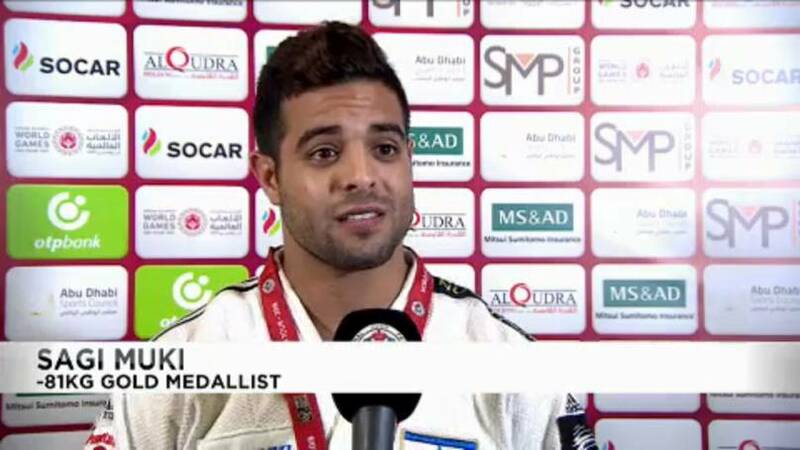 European champion Sagi Muki of Israel was the hero on day two of the Abu Dhabi Judo Grand Slam. 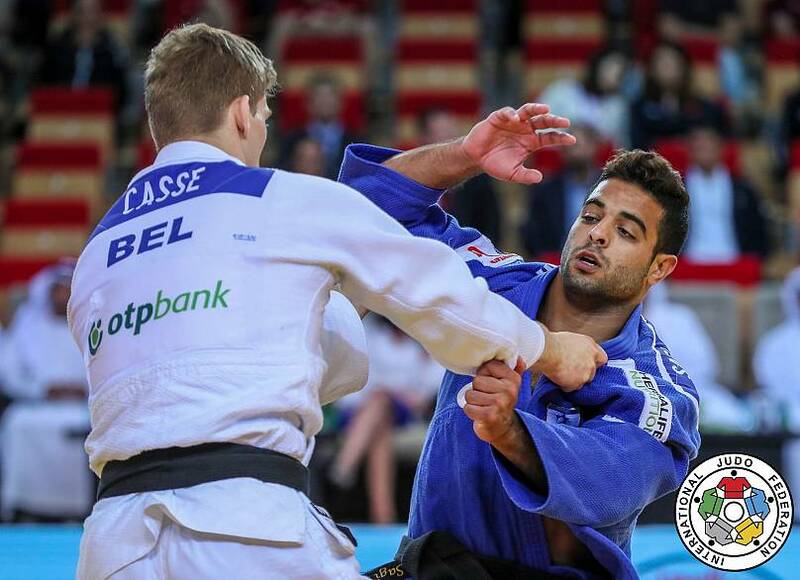 Muki won Grand Slam gold for the second time and soaked up every second of joy and emotion following the -81kg final against Zagreb Grand Prix silver medallist Matthias Casse of Belgium. Judo paved the way for the historic participation of Israel, who competed under their national flag for the first time in a Gulf nation. 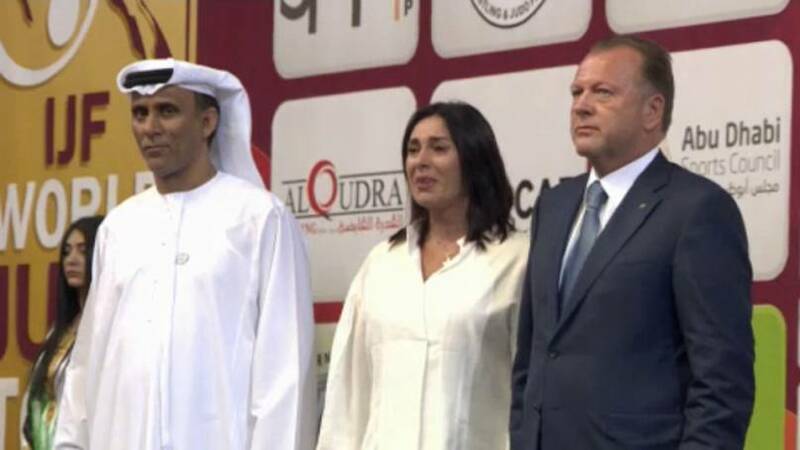 Israel's Sport and Culture Minister Brigadier General Miri Regev presented Muki his gold medal before the President of the U.A.E Judo Federation, H.E. 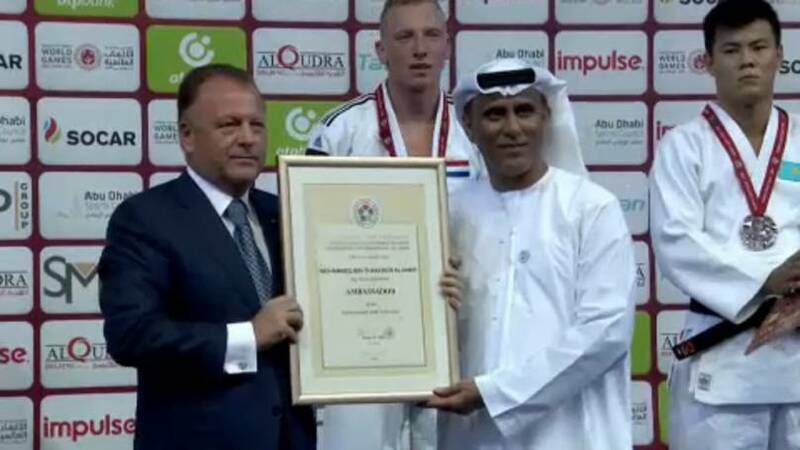 Mohamed Bin Tha'loob Al Derai received a diploma from IJF President Mr. Marius Vizer for being an Ambassador for Friendship and Peace. The three stood united for the national anthem of Israel. And there were tears of joy, that only sport and judo can achieve. "I want to thank also, Mr. Vizer, also Miri Regev and the communication here in Abu Dhabi, that enabled us to fight with our flag so I want to thank everybody for this. I am very happy," Sagi Muki said in an interview. Our Woman of the Day was Margaux Pinot. The French Judoka won her maiden Gold medal at a Grand Slam here in Abu Dhabi, defeating Miriam Butkereit of Germany to stand on top of the under 70kg podium. 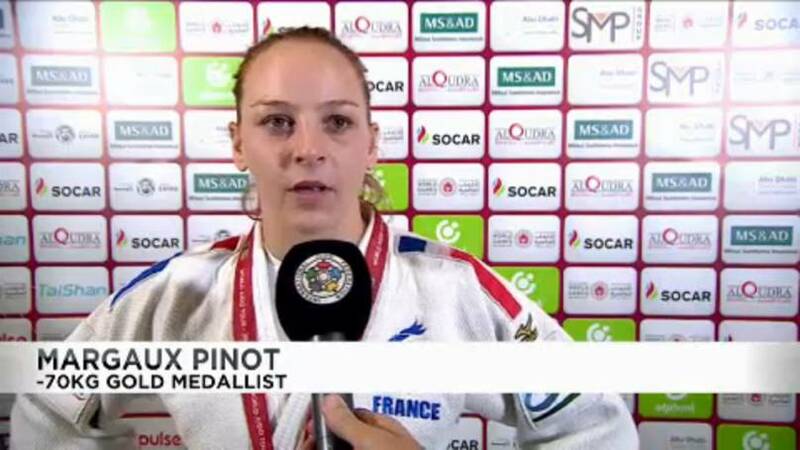 France’s Pinot finished unbeaten to earn her country’s first gold medal in Abu Dhabi, with the three-time Grand Slam bronze medallist recording a career-best result to deny her German rival a first Grand Slam win with a morote-seoi-nage which earned a waza-ari score. "In the final I fought the German girl, who I fought a few weeks ago in Glasgow, so I’m proud of my day and I’m proud of my medal," Margaux Pinot said in an interview. Elsewhere in the women's division, World Championships bronze medallist Juul Franssen of The Netherlands took under 63kg Gold by countering Andreja Leski of Slovenia in Golden score of the final. Franssen extended her head-to-head record over the Slovenian to 2-0 with a measured performance and she got to hear the Dutch anthem ring out in Abu Dhabi. London 2012 Olympic champion and Rio 2016 Olympic bronze medallist Lasha Shavdatuashvili continued his country's fine form from yesterday, making Georgia’s medal tally 3 Golds. Shavdatuashvili won the under 73kg category by countering Akil Gjakova of Kosovo in the final. The Georgian star, who took silver at the Paris Grand Slam in February, finally topped the medal podium at a Grand Slam in his 11th attempt by a waza-ari score against Gjakova in the reverse result from the first Grand Slam of the year. But the real story was the power of unity, friendship, peace and respect on a memorable World Judo Day.